Special interest groups are the scourge of the common interest, are they not? The Founding Fathers, in The Federalist Papers, recognized the danger posed by “factions,” but assumed that competing groups would keep the balance. They could not have foreseen our current Special Interest State, wherein tens of thousands of special interest groups exert such profound influence on politics, policies and life in the United States. Nowhere is this more evident than in California, my adopted home state. In California, as in much of the country, government is forever and hopelessly trapped in interest group politics and therefore, forever large and growing. Interest groups are intractable, in this view, because they are always able to devote more resources to their specific causes and concerns than are any conceivable guardians of the common interest. California’s predicament is a perfect illustration of public choice theory, which shows that government will always act in its own interest, interest group politics seem to be the logical and inevitable end-point of democracy. Multiply this process by the tens of thousands of special interests that lobby, petition and influence politicians and the public sector and it becomes clear why government will tend only to grow, never to shrink, crowding out the private sector. Over the decades the number of special interests has expanded exponentially, whether Democrats or Republicans control Sacramento or Washington. But eventually this system must overwhelm carrying capacity. Maybe in California we are approaching that limit even faster than the rest of the country. Debts, deficits, waste, inefficiency and voter/taxpayer fatigue must at some point render the special interest state untenable. Readers of this web site are familiar with the dire situation in California: a budget deficit of gargantuan proportions, driven by increases in public sector spending that have outpaced population growth plus inflation, now combined with a drastic drop in state revenues. Attempting to deal with the situation, the Governor and legislators have placed six measures on the May 19th special statewide election ballot. Proponents claim the measures will stabilize the budget process, save billions, modernize the lottery, preserve needed services, and cap elected officials’ salaries. Opponents claim the measures will raise taxes, not put a meaningful cap on spending, and not solve the state’s basic problems. A new poll by the Public Policy Institute of California asks voters, “Would you say the state government is pretty much run by a few big interests looking out for themselves, or is it run for the benefit of all the people?” Among likely voters, 76% say special interests dominate the state government which, only a few decades ago, was once touted as having one of the best, most forward-thinking governments on the planet! According to Shane Goldmacher, writing in the Sacramento Bee, they’re right. The six ballot propositions, agreed upon in February’s budget deal between Governor Schwarzenegger and the Legislature, are designed to please or neutralize the state’s most powerful political players: labor unions, public service workers, the teachers union, casino-operating Indian tribes, the liquor, beer and wine industry, and the oil industry, to name a few. Some of these very interest groups protected in the budget deal are bankrolling the campaign to ratify it. But, writes Goldmacher, the influence of such groups is, more often than not, simply unspoken. They were carefully crafted to avoid causing any pain or requiring any sacrifice by Sacramento’s heavyweight special interests. They were written with stultifying complexity, the better to sell them to voters with simple-minded sound bites. Their political perspective has far more to do with inside-Sacramento tactics and strategy than with the real lives of real people. The special interest state is the third iteration of American politics and policy, in DeLong’s analysis. The first was the Civil War and its aftermath, which established that sovereignty belongs to the nation first and the states second. The second great institutional upheaval was the New Deal, which radically revised the role of government to include responsibility for the functioning of the economy. As governmental power expanded, it needed to delegate management and implementation of tasks to those with administrative abilities or specific expertise. This stimulated the rise of agencies, legislative committees and subcommittees, and yes, interest groups. Eventually, perhaps inevitably, power came to rest with those with the greatest interest or the most money at stake. Thus was the Special Interest State created, with various interest groups seizing control over particular power centers of government and using them for their own ends. This Special Interest State must expand, explains DeLong: the larger and more complex the government becomes, the higher the costs of monitoring it. No one without a strong interest in a particular area can be expected to possess the time and energy to keep track. As a result policy turf is left to the beneficiaries of government action. Special interests wield their power through laws, regulations and the tax code. Voters may object, and politicians may pronounce and promise, but nothing ever gets done to diminish special interest power. In fact, special interests have become their own special interest: the millions of lobbyists, governmental officials and compliance officers that make a living from the system and resist all reform. But the special interest Third American Republic, writes DeLong, is falling of its own weight. American progress cannot proceed without reforming it. Sheer size. Government in the US consumes about 36% of GNP (federal and state combined). This does not reflect the impact of tax provisions, regulations, or laws, however, so an accurate estimate of how much of the national economy is actually disposed of by the government is impossible. Whatever it is, it is growing apace, and the current administration is determined to increase it considerably. Responsibility. As the government has grown in size and reach, it has justified its claims to power by accepting ever more responsibility for the economy and society. Failure will result in rapid loss of legitimacy and great anger. Lack of any limiting principles. There is no limit on the areas in which special interests will now press for action, nothing that is regarded as beyond the scope of governmental responsibility and power. Furthermore, special interests try to convert themselves into moral entitlements to convince others to agree to their claims. Compromise is regarded as immoral. Conflicts. The combination of moral entitlement, multiplication of claimants, and lack of limits on each and every claim throws them into conflict, and rendering unsustainable the ethic of the logrolling alliances that control it. U.S. politicians do not grasp the situation. None of the leaders of any branch are demonstrating an appreciation of the problems and limits of the Special Interest State. Past Governors and Presidents have understood the importance of keeping special interests at some distance. They may have given up the agencies, but most ensured at some level, the executive, at very least, acted in the overall public interest. This is no longer the case. Over the past few years, political winners have become increasingly aggressive. Losers have become increasingly restive, ready to attack the legitimacy of the winners’ victory. This was true for George Bush and now Barack Obama. Politics has become more like a contest between equally fierce warring gangs than a civilized contest for ideas. 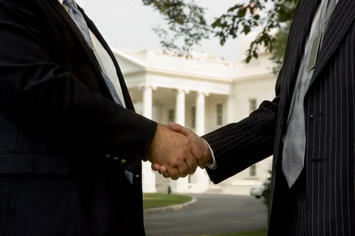 Each party is regarded by the other as a principle-free alliance of special interests, eager to loot the government. Given these trajectories and the lack of any mechanisms for altering them, writes the author, it is hard to see how the polity of the Third Republic can continue. Nor is there any easy self-correcting mechanisms in the Special Interest State. Quite the reverse; the incentives all seem to be pushing the accelerator rather than the brake. Thus the need for a new break: what DeLong calls the Fourth American Republic. What will this look like, and how will it come about? Two possibilities for change seem most promising, he believes. The first is a third political party that explicitly repudiates the present course and requires that its members reject the legitimacy of the Special Interest State. This would require a certain almost religious fervor, but the great tides of history and politics are always religious in nature, so that is no bar. In California at least this comes up often in meetings between interested, but frustrated, citizens. This second would be more bottom-up. In California, there is a growing movement to change the Constitution. This could also occur on the national level as well. There could also be a groundswell to force responsible change within the current constitutional framework. This may seem a bit pie in the sky but, as the California crisis worsens, that of the country may not be far behind. Something, quite clearly, needs to change.